Hello! I hope you all had a lovely weekend! Mine was busy, but fun, and actually not much holiday related. I like it! 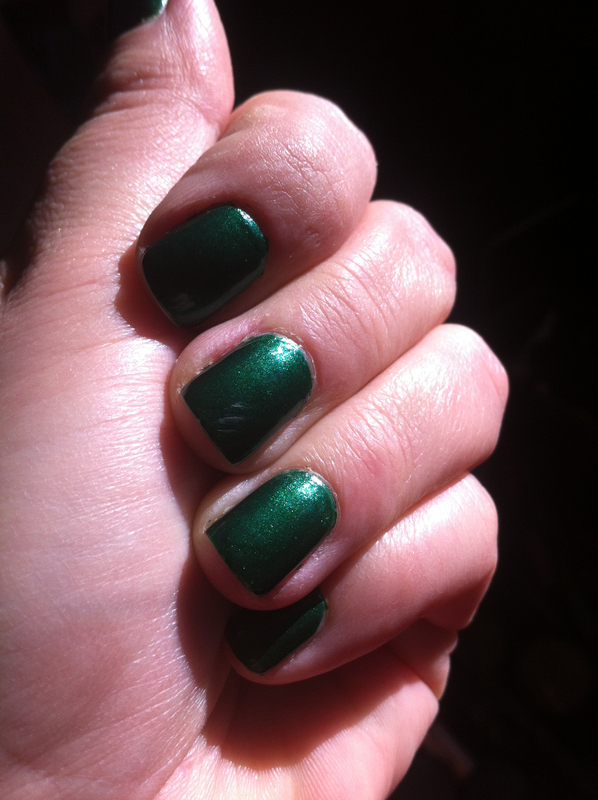 First I would like to quickly show you Holly by Zoya. It is from their 2011 Gems and Jewels Holiday Collection. 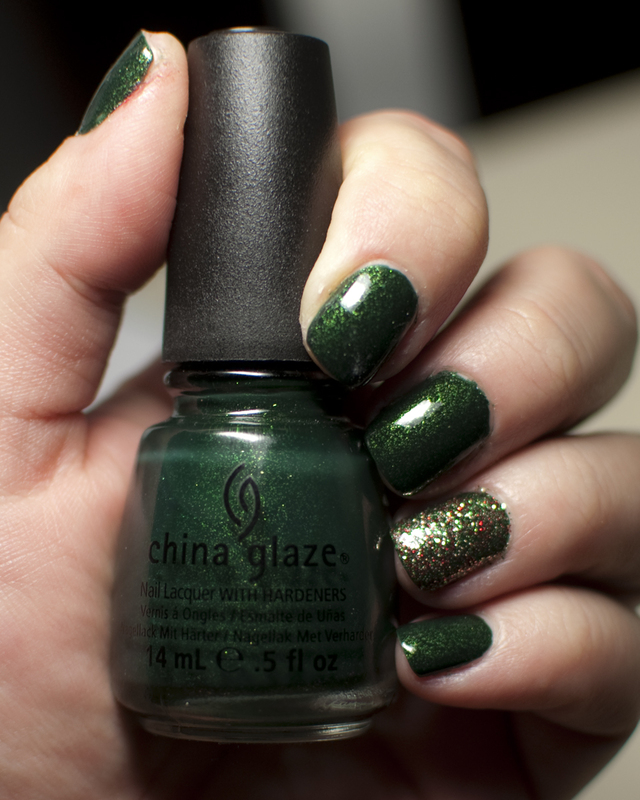 Zoya describes it as: A rich holly green with subtle yellow tones in a luminous metallic finish. 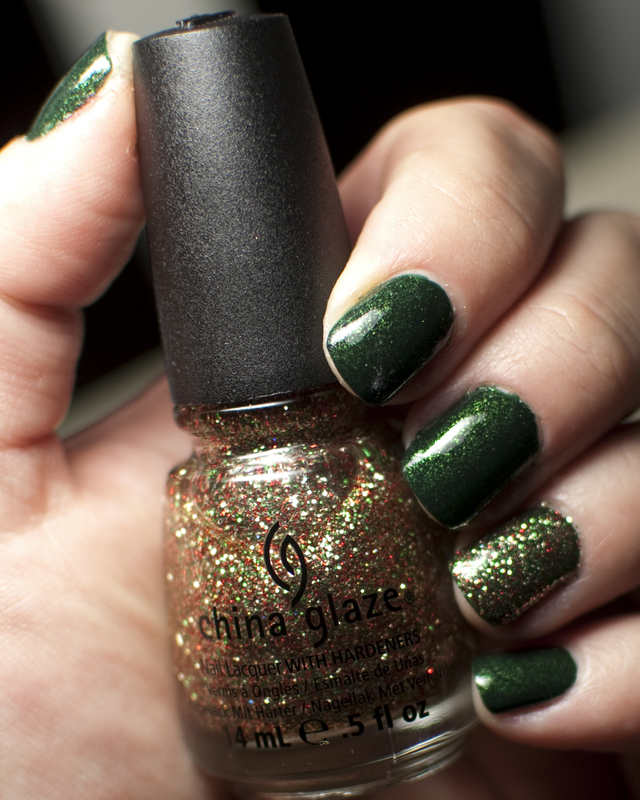 Great for giving the nails a flash of rich gem-toned color. When I saw it online a few months ago, I thought it looked gorg. I got it, and was unimpressed by the looks of it in the bottle. However, after putting it on…I was even more disappointed. Then I loved it! 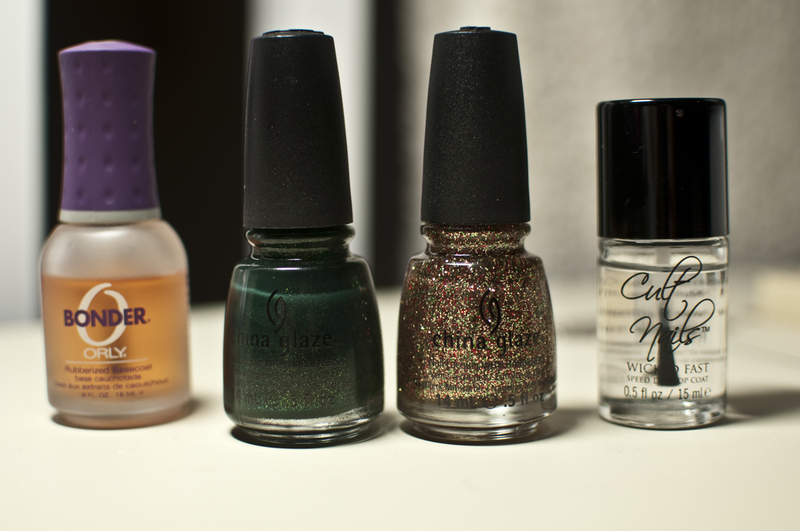 I really could not decide :) I did not take very good photos of it, because I then decided that I had an idea for some nail art I wanted to do, involving this colour, so I did not take any. What you see here are only iPhone photos. 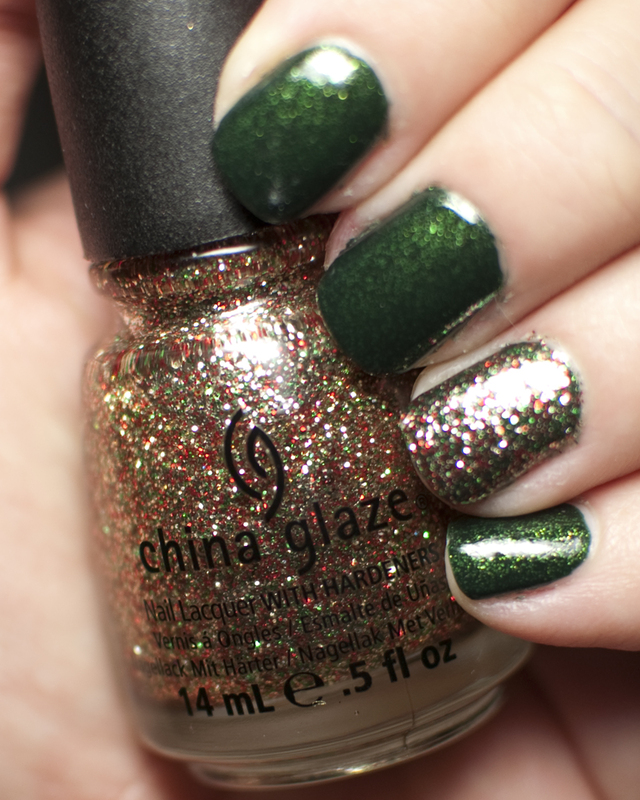 Next up are two from the China Glaze Holiday 2011 collection “Let it Snow” – Glittering Garland and Twinkle Lights. These are two colours I was SUPER excited to get. Let’s start with Glittering Garland! Glittering Garland was pretty interesting to me. It definitely is a jelly polish, but also super glittery. What I really loved was that it is almost tone-on-tone with the glitter and jelly. 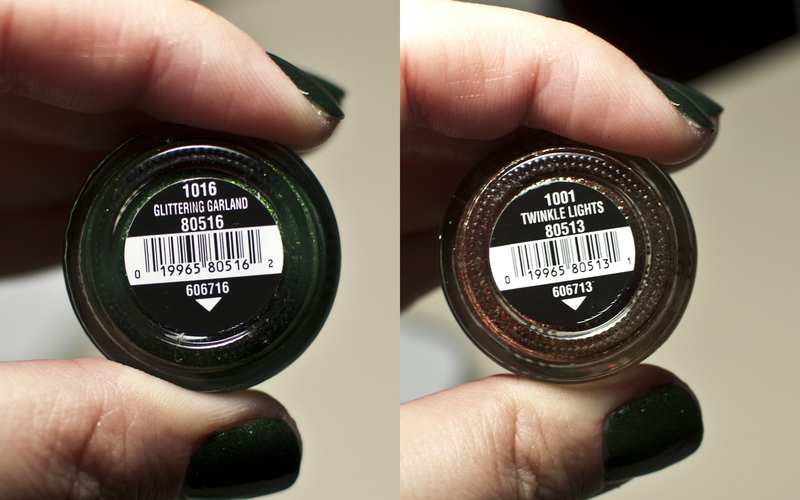 There is a mix of light and dark green flecks throughout it…and while one coat looks horrendous (as most jellies do on me, at least), two coats got it perfectly opaque and even. As you may also notice by the photos, it doesn’t really dry matte, but adding topcoat really boosts up the shine. Va-va-voom! It reminds me of Christmas for sure, and I think is super fun and also very classy. I decided to add Twinkle Lights to only my ring finger nails as an accent. 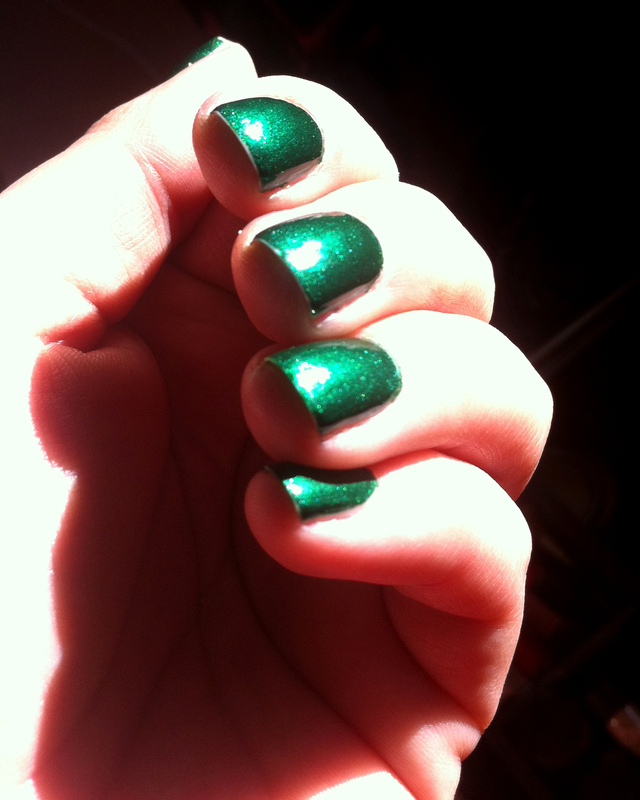 I had played around with this one in between manis a few times, and I just could not decide what I thought of it. I loved the colour, and when the light hits it – WOW. However, I found that putting it on, if you wantedit opaque, it looked thick and just a little cheap (IMHO), but thin it shows through to the nail a bit as it has a clear base. That is often fine, but if your nails are peeling or discolored as the former can often happen in the winter, it’ll show through. Soooo, I decided to put one thinner coat over the green, and I think I found the perfect balance! :) You still see the amazing gold, red, and green flecks, but with the darker base you still get coverage. I am also throwing in a photo that doesn’t really show the colour on the nail too well, but I think it highlights a bit better how amazing this polish can look when the light hits it! This is under an OttLite. 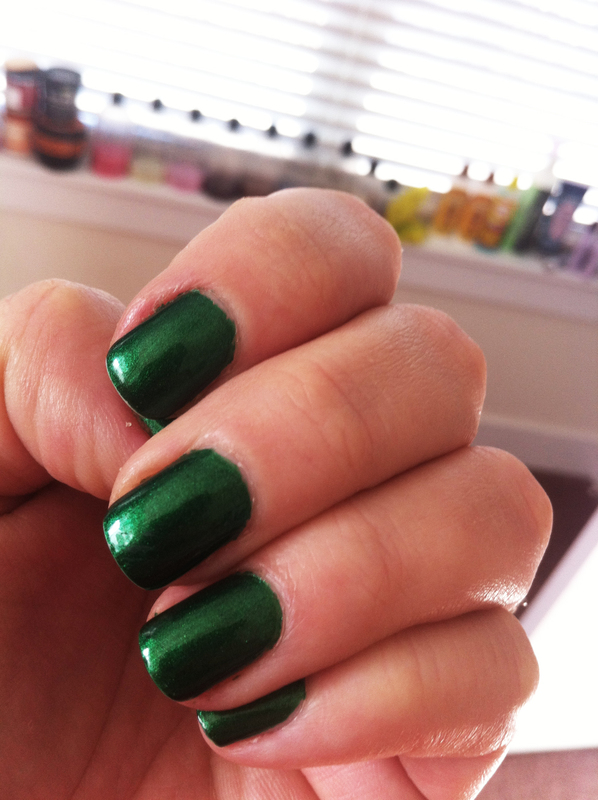 What kinds of manis are you doing for the holidays? Have any photos to share, or any interesting combinations you have come up with using colours we have shown on here so far (or ones close to it)? Post about it in the comments!